Selected in the 11th round of the 1990 NFL draft, man mountain offensive tackle Roman Matusz went collegiality to Pitt. At 6’4″, 285, Roman was Team Captain of the Panther offensive line that ranked 13th nationally in total rushing yards. 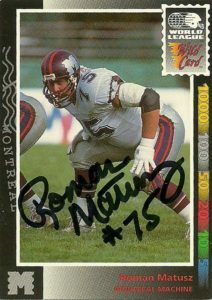 Roman was selected by the Montreal Machine in the 1992 WLAF Player Draft. He’d start at tackle for the franchise that’d average 104 yards rushing a game, but on the flipside allow 4.4 sacks a game. After the season, the Machine like all WLAF franchises was reorganized. Roman retired from football and transitioned into the financial industry. Currently he lives in Pittsburgh where he is a Co-General Agent at Mass Mutual.